ProfitZoom is a profit management system for field service providers. The advanced user interface is the only one of its kind, eliminating the reliance on multiple systems for daily workflow and bringing all business operations and processes together in one complete system. 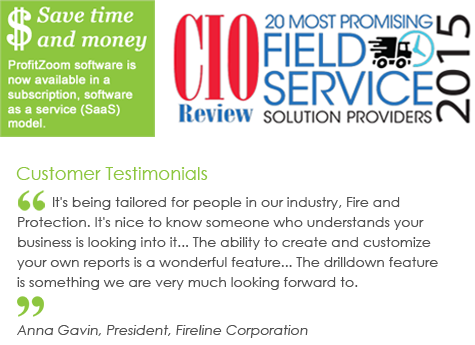 ProfitZoom’s history in the Fire & Life Safety, HVAC/R and Electronic Security industries make it the definitive choice for providers seeking business management software such as service scheduling software, fire inspection software, fire protection software and more. Our mobile field service software gives subcontractors the tools and functionalities to streamline operations and manage more efficiently. Schedule an interactive demonstration and see the possibilities ProfitZoom can bring to your business!